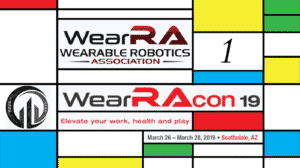 The Wearable Robotics Association Conference 2018 continues on full blast at the Scottsdale Plaza Resort in sunny Arizona. WearRAcon18 day two opened up with an hour-long networking session and breakfast, which was in addition to the Opportunites Bridge Program. 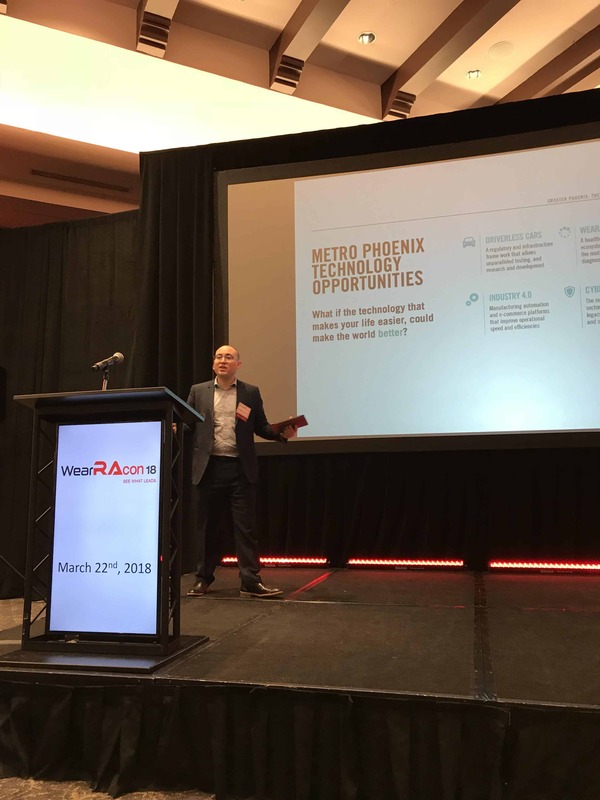 Unlike other days, the meetings began with something different, a presentation by the Greater Phoenix Economic Council on the advantages of living and working in Phoenix. But this was not so much a sales pitch for the city as a push to make the city of Phoenix a top-tier wearable robotics hub in the world. 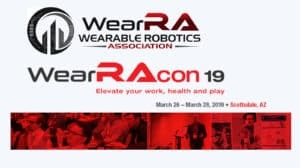 With the low rent cost and increasing tech presence, what would it take to get the Wearable Robotics Association and several exoskeleton companies under the same roof? Dr. Hermano Igo Krebs, Principal Research Scientist, MIT was the third and final keynote speaker. He is a founder of several rehabilitation robotics companies, Interactive Motion Technologies which was later purchased by Bionik Labs, and more recently, 4Motion Robotics. According to Dr. Igo Krebs, in the past, the key to robotics rehabilitation was not the technology, but the shift in understanding that the brain is plastic and can build new pathways after damage. In other words, recovery was also possible in addition to functional compensation. Another significant change that had to happen was to prove recovery can occur more than three months after injury. Dr. Krebs’ work is like a long journey. His work and research continues to push and update the perception of physical therapy. But adding more robotics and therapy sessions can be expensive, is it worth the cost? His research, conducted with the VA says yes. 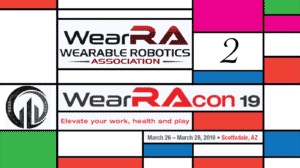 Running intensive, wearable robotics enabled physical rehabilitation ends up with lower total medical costs over time for the participants. The work continues, with studies in England. However, gait rehabilitation testing is another story. Studies of robotic gait training (body support on a treadmill) do not show conclusive results in favor of robotic rehabilitation. This is partially reflected in the still many unanswered questions such as does the user even need to be standing up or could they be sitting (other common questions include how vital is capturing the user’s intent or the shift of body weight?). Another issue that Dr. Krebs has is do medical robots need to help move the leg forward or do they just need to clear a path for the leg to swing forward due to gravity naturally? An iteration of the idea is a split treadmill, which alternatively lowers to get out of the way of the natural swing of the leg. If people are learning to be afraid of robots, how would they feel if someone (i.e. their manager) wants them to wear one? How to show that the human combined with machines can be better than just one or the other? 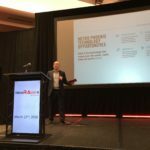 The rate of productivity improvement has dramatically decreased, is human+machine the solution? Most easily automated tasks have already been given to robots, are wearable robots the way of the future? Reporting on both the expected but also unexpected effects of exoskeletons such as the EksoWorks Vest. Studies need to be not only conducted but also published and shared. The EksoWorks Vest testing at Ford reached 300M online impressions. This was a “feel good” narrative that portrayed exoskeletons in a positive light to the world, a win for the entire industry. PACE – reimbursement focus on patient access to rehabilitation care. 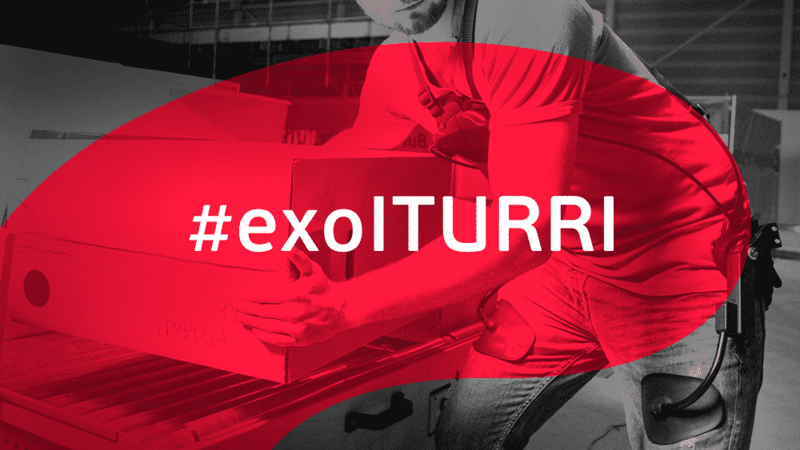 An initiative that now spans across multiple companies. 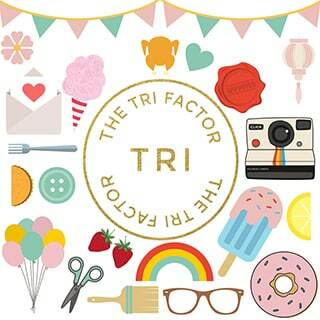 Next was the third Innovation Challenge. Eight finalists successfully utilized the main stage to wow the audience with their creative ideas in a series of dynamic lightning pitches. 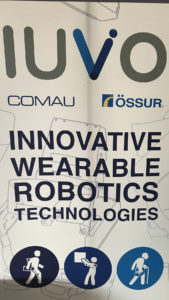 Each person, team or small company had five minutes to present the background, need, and implementation of their ideas which included novel mechanical joints that can be worn under clothing, EMG controlled animatronic tails, new hydraulic and pneumatic actuators, and multiple working exoskeletons (full recap coming soon). This is a continuation of the work by Greg Sawicki and the passive ankle exoskeleton. One major issue with releasing this system into the world is that the spring stiffness needs to be adjusted with walking speed, incline, and surface conditions. To perform evaluations, a test setup which allows the spring properties to be actively changed (using a tethered system) to quickly accumulate test data was created. As before, ultrasound was also used to visualize the activity and speed of the leg muscles. The focus is now shifting on the elderly population. We know that staying mobile is important to staying healthy. However, mobility decreases with age. One possibility for this is destabilization in the initial foot lift. Could the elderly be kept active and mobile by “retuning” the body muscles using passive, spring and clutch devices? Unfortunately, there are no current commercialization plans. This breakout session was led by Lars Schilling, Noonee and Nicola Vitiello, IUVO. Transitioning from white to blue color jobs is difficult. What does that mean? It is relatively easy to explain to manufacturing managers and engineers the basics of the Chairless Chair: aging workforce, reduction in injuries, etc… However, applying the product on the production floor can be very challenging. If a worker is used to performing the same task for 1, 5, 10, 20 years, they will be shocked when their process changes. Furthermore, it can take thirty to forty days to get entirely used to the Chairless Chair (or most any other wearable for that matter). That is why it is very important to train the sales team to not oversell the device and be acutely aware of the device capabilities and limitations. The lack of standards, test methods, and long-term test studies are issues that are not to be understated. In reality, no one has long-term studies, the implementation of the technology is just too recent. 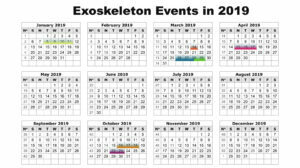 This causes inconsistency in the exoskeleton implementation, where at one plant it can be successful for one application, and not successful at another plant for the same application. This is why pilot programs and minimum initial implementation have been necessary so a few people on the site can be properly educated on the correct use and then they, in turn, can train others. Additional challenges include how to deal with local government laws, and who takes the blame if something goes wrong with the exoskeleton? 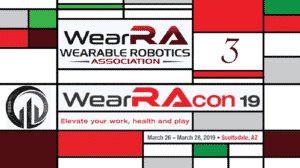 Is this another opportunity for a combined effort between exoskeleton companies? Part 2, an introduction to IUVO – “to assist” a spin-off from the E.U. BioRobotics Institute of Scuola Superiore Sant’anna. This university is very good at rapid prototyping of wearable technology. An aging society is a problem at work, with Italy being one of the oldest countries. In Europe, this is a problem for several industries such as construction. The need for assistance with mobility is present. However, to get large adoption the consumer market will have to be targeted and tackled. 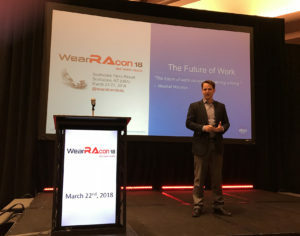 To paraphrase Nicola, exoskeleton technology is not all that young, there have been patents issued over 100 years ago, but now is the time to be an entrepreneur and incorporate. Just keep in mind that you have to be constantly challenged to improve and change your product, while never losing your focus that you need to serve the end user. 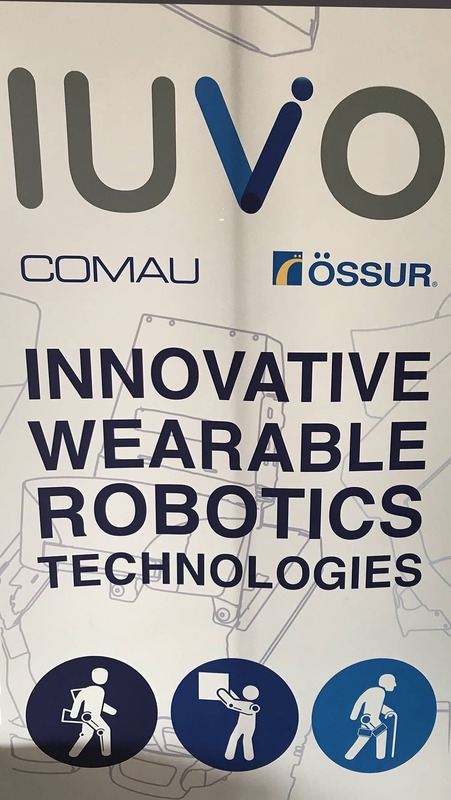 Finally, it was also announced that Comau will release the IUVO passive shoulder exoskeleton in the coming months. Q&A: What needs to happen to sell more devices? A unified message to media, governments, and stakeholders where all groups are on the same page and consistently and meticulously present a consistent message. 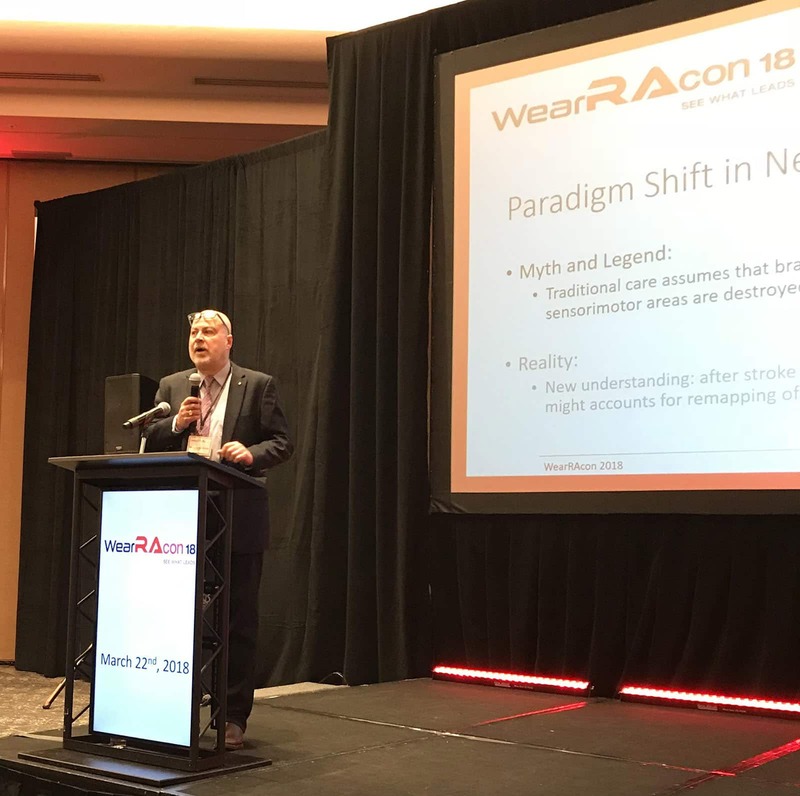 WearRAcon18 day two concluded with a reception and the announcement of the Innovation Challenge 2018 fan favorite as voted for by everyone in the conference and the winners as voted by the panel of judges from Ekso Bionics, StrongArm Technologies, and Noonee. The Innovation Challenge was once again sponsored by StrongArm Technologies now for the second year in a row. Thank you for the postings. Can’t wait to hear more about the Innovation Challenge pitches.